One acre of tropical beauty and privacy are the hallmark of the gorgeous Stanford House. You can get married in the custom Italian gazebo by the water, and wet bar and jacuzzi will make every night feel like a party. Enjoy membership at The Royal Fairmont Pavilion beach club or stay in your private garden oasis. There’s no shortage of beauty at Stanford House. Stanford House is a picturesque garden estate in Polo Ridge. 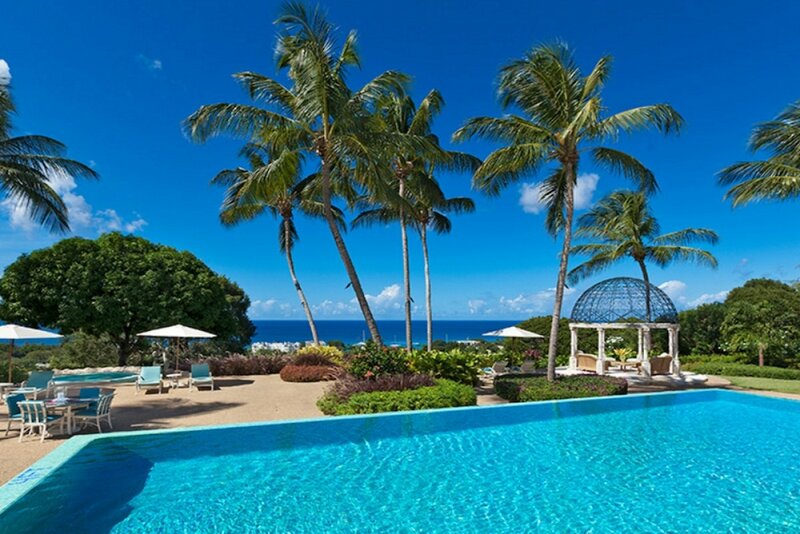 An elevated position across from the Barbados Polo Club offers magnificent views of the island and the sea. Outdoor living and entertaining take priority at Stanford House. A large terrace, fully equipped bar, and lounge offer dining space, and the pool deck surrounds a large infinity-edge pool. The bar has a grill, seating, and a cocktail area. Over one acre of manicured gardens envelop the property and mature palms frame the ocean view. The gardens incorporate water features, statues, a Jacuzzi, and an Italian gazebo covered in fairy lights. The extended veranda provides more dining space and leads into the elegant, fully air-conditioned interiors. Stanford House is constructed on one level and accommodates up to ten people. The lounge opens to the pool terrace and gorgeous sunset views, and an eight foot aquarium runs along the opposite wall. The media room sits on the other side, and has a 60” plasma TV with surround sound, satellite, DVD, Sony PlayStation, and WiFi. The media room also opens to its own patio. The fully equipped kitchen opens to the lounge and the exterior wet bar. Off the kitchen, there’s a laundry area and generous parking with covered spaces for two cars. A powder room and three bedrooms connect to the entryway foyer at the front of the house. The spacious master suite offers seating, a 42” plasma TV, a dressing room, and an office. Its bathroom has a Jacuzzi tub and a large walk-in shower. The second bedroom sits adjacent, and the third bedroom opens to the veranda. The fourth bedroom sits opposite the master and has a tub in its bathroom. The fifth bedroom stands alone by the pool and features a sitting area and a private patio. All five bedrooms have an ensuite bathroom. Stanford House is staffed with a full-time butler, cook, gardener, housekeeper, laundress, and a security guard during the months of December - April. The estate is open to host weddings and has membership at The Fairmont Royal Pavilion’s beach club. The club is only a 10-minute drive away and includes parking, sunbeds, umbrellas, hire of water sports equipment, restrooms/changing facilities, outdoor showers, and access to the hotel’s restaurants. Paynes Bay Beach is 2 minutes drive down the hill.